This study reviews how West African deforestation is represented and the evidence which informs deforestation orthodoxy. On a country by country basis (covering Sierra Leone, Liberia, Cote D'Ivoire, Ghana, Togo and Benin), and using historical and social anthropological evidence the authors evaluate this orthodox critically. 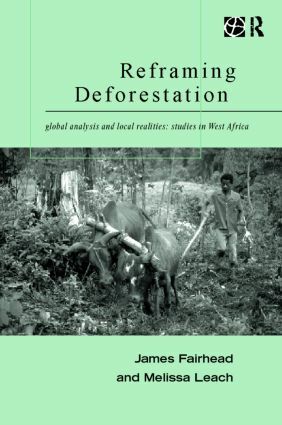 Reframing Deforestation suggests that the scale of deforestation wrought by West African farmers during the twentieth century has been vastly exaggerated. The authors argue that global analyses have unfairly stigmatised West Africa and obscured its more sustainable, even landscape-enriching practices. Stessing that dominant policy approaches in forestry and conservation require major rethinking worldwide, Reframing Deforestation illustrates that more realistic assessments of forest cover change, and more respectful attention to local knowledge and practices, are necessary bases for effective and appropriate environmental policies.